Archbishop Eamon Martin of Armagh has said the Irish Church is “extremely happy” with how the World Meeting of Families in Ireland went but he also said it “had been hijacked” by Archbishop Carlo Mario Viganò. In an interview with Crux News, Archbishop Eamon Martin said he saw the WMOF2018 as a “tale of two congresses”. One was what happened on the ground, and the other was what happened in the media. “Essentially on the ground, it was an event of great joy and participation in the life of the Church. We got a great sense of a vibrant, dynamic Church, not just in Ireland, but indeed, the world,” he told Crux News. But there had also been “a huge concentration on the abuse issue”, which Dr Martin said “was merited” due to the reports from the US and elsewhere around the world. 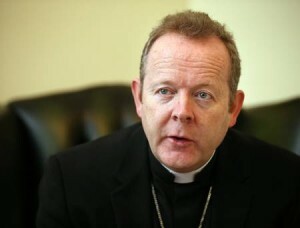 Asked about the impact of Archbishop Viganò’s letter on 25 August, the Primate of All Ireland explained, “It was on the last day of the event and we were actually flying out to Knock, the national Marian Shrine of Ireland, and we became aware of the fact that overnight in the States this news had broken. He paid tribute to Pope Francis and the manner in which he had dealt with the controversy “very quietly and with great serenity”. On 25 August, Archbishop Viganò released an 11-page letter setting out a series of warnings he claims were made to the Vatican regarding Cardinal Theodore McCarrick. In June 2018, when it was revealed that McCarrick had been accused of abusing a minor as well as harassing adult seminarians, he was sanctioned by Pope Francis and resigned as a cardinal. Pending the outcome of a canonical trial, he was ordered not to celebrate Mass publicly and confined to a monastery. Archbishop Viganò claimed in his letter that in 2007 he wrote a memo on McCarrick that led Pope Benedict XVI in 2009 or 2010 to place restrictions on McCarrick’s movements and public ministry, not allowing him to venture beyond the seminary grounds where he was living, and not permitting him to say Mass in public. The letter’s “unsubstantiated allegations and personal attacks” have been described as “an extraordinary public declaration of war against Francis’ papacy”. Cardinal Joseph Tobin of Newark released a statement in the wake of the letter criticising Viganò’s statement for “factual errors, innuendo and fearful ideology”. Elsewhere in his interview with Crux News, Archbishop Eamon Martin said that what was “very beautiful” about Knock was the fact that the apparition of Our Lady was “quite unique – when she appeared at Knock she said nothing, she was silent before the lamb, before the altar, with the presence of St Joseph and St John. Asked about the Synod of Bishops on Young People, the Faith, and Vocational Discernment, which the Archbishop is attending on behalf of the Irish Church, along Bishop Donal McKeown, he said he had the sense that all participants were focused on “the challenge of getting the word of God, getting the encounter with Jesus Christ out to our young people.